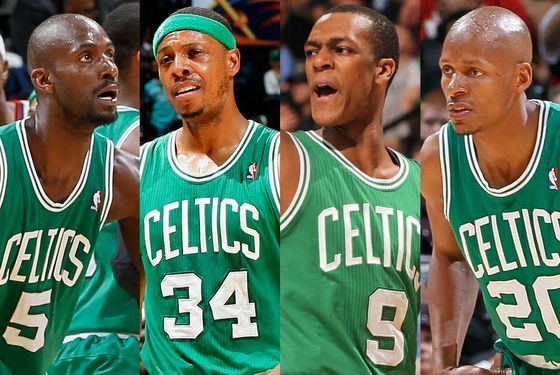 Last night, the Celtics did not play the following men: Kevin Garnett, Ray Allen, Paul Pierce, Rajon Rondo, and Shaquille O'Neal. If this is their new rotation, man, they're going to be so easy to beat in the playoffs. Of course, it won't be like that at all: The Celtics punted last night's 95–94 overtime loss to the Wizards in order to rest their elderly superstars — by "elderly," we mean "our age" — for the playoffs. But it also meant ceding the No. 2 seed in the Eastern Conference to the Miami Heat, which means ... the Celtics will be playing the Knicks in the first round. Oh, gentlemen, it is ON. First off, though, just to have a brief second of pretending that last night's Celtics team will be the team the Knicks will face in the playoffs, here is the hilarious Von Wafer play that cost the Celts a win last night, via Tas Melas. We could watch that all day. But, back down to business! The Knicks-Celtics series will tip off either Saturday or Sunday — we won't know until Wednesday, though, considering the Bruins host the Canadiens in the NHL Playoffs on Saturday night, we'd take a gander that it'll be Sunday — so we're going to have at least four games of playoff craziness, and it'll be against the Celtics. It somehow means more that it's Boston rather than, say, Toronto, or Atlanta, or Milwaukee. The Knicks and Celtics actually have one more game to play, a completely meaningless one on Wednesday that should be of interest only to Andy Rautins enthusiasts. (Of which there are many.) But neither Knicks game, that one or tonight's home finale against Chicago, means much: It's the No. 6 seed, it's the Celtics, and it's on. This is obviously a different team now — for example, we suspect there'd be someone different taking that shot — but that was the night when it felt like the Knicks were starting to matter again. Lots has happened since then, to both the Knicks and the Celtics. It feels sort of right playing them again. There are of course a million of those. Just a little taste. Coming this weekend.